Sen. Dion’s so-called “Community Protection Order” bill, LD 1884, will have a public hearing before the Judiciary Committee on Tuesday, April 3, at 1:00 PM in Room 438. This is the only anti-gun bill which has made it this far in this session. We absolutely need your help to end it. Please find a way to be at the State House for this hearing. It may cost you a vacation day, or even a day’s pay, but it will cost us all far more if this bill becomes law. We cannot allow that. The text of the bill is at the link below. Read it and weep. And remember, this is only what they think they can pass *today*. You can rest assured that if this becomes law, it will be amended to be even worse at the first opportunity. Whereas most states are content to wait until a prohibited person is caught with a firearm, California’s approach is much more proactive. The California Department of Justice cross-references known firearm owners with individuals who have been convicted of felonies, deemed mentally unstable, or given domestic violence restraining orders. All such individuals are placed on the APPS list. That allows a special gun confiscation unit to visit those people and ensure that they relinquish their firearms. We are programmed to automatically accept any effort by those claiming to be in support of the Second Amendment to the U.S. Constitution. Therefore, passage of any law that claims to protect gun owners or ease the restrictions on gun ownership, we blindly accept as a good thing. It might be better…or the equivalent of being hung with a new rope, than continued chopping to bits our Second Amendment rights, but even if you keep cutting off pieces of a plank, a little here and a little there, eventually there’s no more plank and you free fall. This Bill, LD 9, is being flaunted as a bill that will prohibit the “comprehensive registry” of all firearms, and that without such a registry, governments and non governmental agencies cannot confiscate guns because they won’t know where to find them. The first question I might ask is this: What will be the state of things in this country WHEN the U.S. Government goes about confiscating our firearms? Will following the rule of law any longer exist? LD 9 prohibits the creation of a “comprehensive registry” (whatever lawyer wants to define that one for us). Comprehensive, in the context used (I’m guessing), means complete. Please define “complete.” Who gets to decide? We are not told that and this is the kind of crap sandwich we are fed by lawyers. They craft laws for themselves not for you and I. So, if it is now unlawful for the Government to “keep or cause to be kept” a “comprehensive” gun registry, does that mean if they leave off the registration, say your sexual preference, does that now make the registry “uncomprehensive” and thus can be used by governments and law enforcement when it comes time to confiscate your REGISTERED guns that you REGISTERED when you purchased your guns from a licensed dealer. Stop kidding yourselves! The Second Amendment is the only item in the Bill of Rights that we, not only give away, but do so gladly and all the while believing we are doing the “reasonable” thing. *Editor’s Note* – I concur that the reason Bloomberg (he’s a nanny himself to the rulers over him) wants to pass this law is “mandatory gun registration”…to begin with. The real goal here is gun confiscation. Registration is needed first in order to carry out confiscation, i.e. the tyrant bastards have to know where to go get the guns. If you purchase ammunition with a credit/debit card, you have “registered” that sale and thus told people like Bloomberg, you have a gun. Think about it…or are you tolerant of that and willing to give up that portion of your Second Amendment right? You are playing into THEIR RIGGED SYSTEM. But, please bear in mind that in the process toward gun confiscation, the real goal in foisting this nonsense onto Maine people, is to get a better sense of what they will tolerate. Each time discussion comes up about Question 3, the gun snatchers learn how much more of the Second Amendment they are willing to give up, if for no other reason than thinking it will get rid of maggots like Bloomberg. Don’t be fooled! Demand your FULL and COMPLETE right to bear arms….nothing less. The below letter was written this past July, 2013. 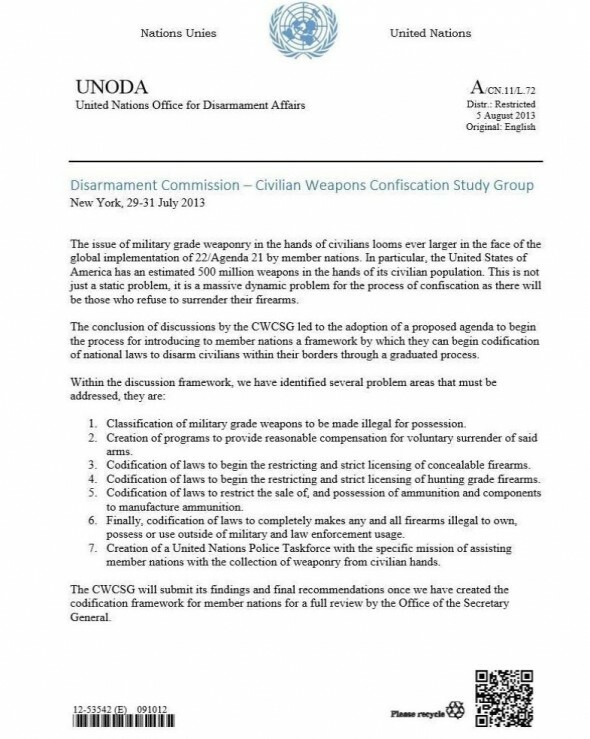 The complete report, “Continuing operation of the United Nations Register of Conventional Arms and its further development“, can be found by following this link. To learn more about the United Nations Office for Disarmament Affairs (UNODA), follow this link.